Maureen Fiedler is the chair of the board and served as the host of Interfaith Voices until February 2018. Maureen is also the editor of two books: Breaking Through the Stained Glass Ceiling: Women Religious Leaders in Their Own Words, and co-editor of Rome Has Spoken: A Guide to Forgotten Papal Statements, and How They Have Changed Through the Centuries. Maureen has been an active participant in interfaith activities for more than three decades, including coalitions working for social justice, racial or gender equality, LGBT rights and peace. In earlier years, she was an activist for the Equal Rights Amendment, one of 8 women to fast for 37 days in 1982 in Springfield, IL for the ERA. Maureen is a Sister of Loretto and holds a Ph.D. in Government from Georgetown University. Her special interests lie at the intersection of theology and public policy. 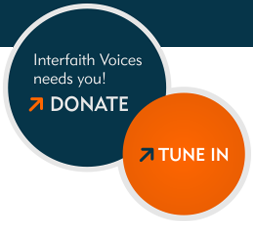 Amber Khan is the executive producer and host for Interfaith Voices, an award-winning public radio program that explores how beliefs intersect in public life and influence our interconnected world. Amber credits her third grade Catholic school teacher for her interest in talking about religion and politics. When Ms. McWhinney asked her to talk about being Muslim, Amber was glad to share - until she was asked to explain the difference between Sunnis and Shia, and she could not answer. The resulting unsettling feeling sparked a curiosity and interest in the history of Islam and the diversity of religious practices. Today, her reporting is informed by two decades of work as an field organizer, policy advocate and strategic communications advisor to public interest groups, private foundations and faith-based campaigns. In those roles, Amber has been a frequent featured speaker at national and global fora for policies and a commentator on a variety of issues including women’s rights, civil rights and the intersection of faith and politics. Now in the role of the interviewer, she enjoys engaging with academics, thought leaders, practitioners and observers of the trends shaping our world. Khan is graduate of Rhodes College and resides with her family in the Washington, DC suburbs. Melissa is from Miami, FL and graduated in 2016 from Tufts University in Medford, MA with a major in English and a double minor in Women, Gender, and Sexuality Studies and Communication & Media Studies. Melissa is a self-proclaimed word nerd who loves storytelling in any and all forms, although she has a specific love for radio and podcasting. Lauren Markoe cames to Interfaith Voices from The Kojo Nnamdi Show, the legacy public affairs program that introduced her to radio. She spent the first two decades of her career as a print journalist, first focusing on government and politics for The Charlotte Observer, The State and The Patriot Ledger. She then moved to the religion beat, working as a reporter and then managing editor at Religion News Service.